Exiles from Nicaragua suffer xenophobic attacks. Protest against the entry of Nicaraguans by some Costa Ricans leaves 44 arrested in San Jose. The Government of Costa Rica condemned the violent demonstrations, speeches and the calls of hatred against Nicaraguans in their country, which it said do not correspond to the Costa Rican way of being. The Minister of Communication, Juan Carlos Mendoza, said at a press conference that the protests are “unprecedented” and called for respect for legislation and the rule of law. 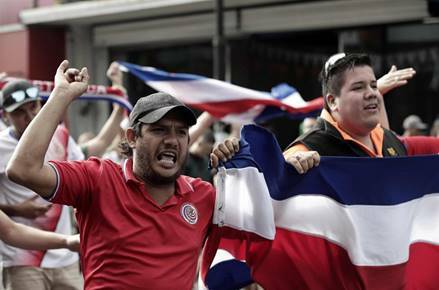 “The demonstrations were of a kind that does not respond to the Costa Rican way of being. Hate rhetoric and calls of hatred and for violence must be eradicated from the country as they are not part of our idiosyncrasy. We must be very careful to preserve the peace and human solidarity that we should practice,” said Mendoza. Hundreds of Costa Ricans demonstrated in a park in downtown San Jose against the entry of Nicaraguans who seek refuge after the political crisis in their country. The protest ended in riots, offenses and several detainees. With cries of “Fuera nicas” (Nicaraguans out) and with Costa Rican flags and shirts some locals organized a march to protest against the entry of Nicaraguan citizens, which they qualify as massive. The demonstration, which at first was to be peaceful, ended in beatings, riots, offenses and several detainees. The police decided to close indefinitely, as a matter of prevention, La Merced Park, located in the center of the capital and where people of Nicaraguan nationality usually meet. The Public Safety Minister, Michael Soto, explained in a press conference that there were three outbreaks of violence, the most chaotic in the La Merced Park, and in two other points of San Jose, the Central Park and the Plaza de La Cultura. The police arrested a total of 44 people, some with a criminal record. They include 38 Costa Ricans, six Nicaraguans and six minors whose nationality was not disclosed. “Several people come to the place with slogans and as they shouted them proceeded to attack some people in the vicinity. Some of the demonstrators had swastikas on their clothing and bodies, a situation that does not belong to the Costa Rican tradition and that concerns us,” said the Minister of Public Safety. Soto said that the demonstrations were organized through social networks and had in their ranks members of anarchic ideologies and Nazi philosophy, as well as belonging to soccer clubs. The authorities also reported the seizure of 13 weapons and eight Molotov cocktails. Xenophobic outcries increased after the Judicial Investigation Office indicated that a Nicaraguan could be responsible for the murder of a Spanish tourist in the town of Tortuguero, Costa Rica. In addition, false news has circulated about the burning of a Costa Rican flag by Nicaraguans, as well as criminal acts in which they falsely incriminate Nicaraguans, which has encouraged violence against that population. “To prevent the situation of violence from growing, we are going to close the La Merced Park indefinitely and it will be guarded by the police. Among the measures we will carry out are operations in the surrounding areas on illegal immigration (…) We will avoid outbreaks of violence, it is our duty to maintain public order,” said Soto. The Costa Rican government indicated that it works in coordinated actions to guarantee national security and to attend the migratory flows that occur in its country. Costa Rica is a small country of 4.9 million inhabitants and about 8 percent of its population are immigrants, mostly Nicaraguans. After the outbreak in April of a socio-political crisis in Nicaragua, the Costa Rican authorities report a considerable increase in requests for refuge from citizens of that country. Official data released on the weekend indicate that since June a total of 23,000 Nicaraguans have sought refuge in the neighboring country. However, they noted that 80 percent are people who have lived in Costa Rica for several years and cannot be considered as refugees.